After the Spring Championship of Online Poker, Powerfest and 888poker’s XL Inferno series all came to their conclusion last week the world of online poker saw its normal Sunday schedule resume once more this weekend. One player who showed no sign of slowing down was the UK’s Michael Chi Zhang, who won the PokerStars $2,100 Sunday High Roller for the second time this year. 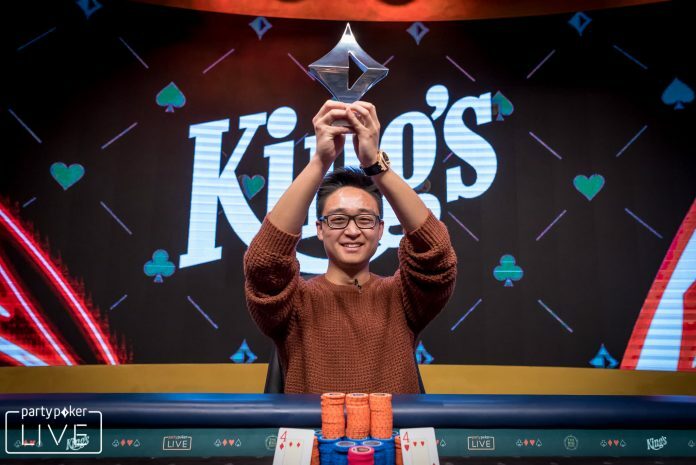 Zhang, who collected his first SCOOP title during this year’s series after victory in Event #22-High, defeated ‘shahter98‘ heads-up to bank $52,676, and repeat the feat he achieved back in January. The runner-up took away $39,663 as ‘Sasuke234‘ departed with $29,865 for their third-place finish. ‘nocz_joker‘ became $172,360 richer after they took this week’s PokerStars Sunday Million crown. The $215 buy-in tournament attracted 6,384 entrants and created a prize pool worth $1,276,800. ‘paardman‘ exited in third-place for $84,881 before ‘T3G3S‘ was the final player to fall, as they collected $120,953. 2016 Irish Open Main Event champion Dan ‘NukeTheFish!’ Wilson won over $69,000 for his first-place finish in the PokerStars $530 Bounty Builder High Roller. The Irishman beat ‘Cashcid Linc‘ to the gold medal prize of $36,540 and also collected $32,477 in bounties along the way. ‘thagrinda444‘ came through a Sunday Warm-Up final table that featured ‘Kaktus26rus‘, Tom ‘Jabracada’ Hall, Michael ‘M_Acevedo’ Acevedo, Rasmus Agerskov Larsen and Armando ‘Zareta’ Sbrissa to claim victory for $37,270. The above players had all departed the field before the final four payout spots were awarded and when heads-up play was set ‘t8ofDiamonds‘ could not prevent ‘thagrinda444′ from taking the win and had to settle for the second-place prize of $26,797. ‘reallygamble‘ was able to collect two silver medals in the partypoker Sunday majors for a combined score of $49,820. ‘DameUnLimon‘ took the $25,350 top prize in the $109 Sunday Major after they defeated ‘reallygamble’ heads-up, and it was to be a second near miss for ‘reallygamble’ when ‘LaurenceGosney‘ sent them to the rail in second-place in the $1,050 Super Sunday Deepstack High Roller and collected $43,838 as the victor. ‘skippyskip5‘ got the better of ‘trucker_‘ heads-up in the $2,600 Super Sunday Super High Roller for $45,500. World #16 Conor ‘ADRIEN_BRODY’ Beresford exited in fourth-place for $11,700 before ‘barrm111‘ banked $19,500 in third. ‘trucker_’ then pocketed $30,550 in second as ‘skippyskip5’ took the glory. The $1,050 Super Sunday Big Bounty Hunter-HR title went to ‘N0-ILPTRI4I2I’ after they knocked out ‘Dextered‘ into the runner-up spot for $20,639.92 + $4,078 (in bounties). ‘N0-ILPTRI4I2I’ collected an impressive $37,618 in bounty rewards on top of the $28,355 winner’s prize. ‘MentulaMagna‘ and ‘Pider Ninni‘ are two players that deserve mention after they cashed for $20,843 and $33,129 respectively for achieving double partypoker final table appearances. Over on 888poker, the flagship $1,050 The $100,000 Whale was won by ‘derharry69’ for a $30,300 payday. ‘M4zlTov‘ was eliminated in the final battle and who took away $20,200 with ‘jt7bl2f‘ receiving $15,150 for third. ‘Fukuruku‘ went the distance in the $215 Sunday Mega Deep after agreeing to a deal with Bryan ‘DePittsterje’ Paris. The latter was sent to the rail in second-place but took the larger share of the remaining prize pool for $16,864 as ‘Fukuruku’ banked $16,635 after defeating the American Paris. ‘Imyurfriend‘ earnt $10,750 for a third-place finish with the UK’s Ian ‘Simpioni’ Simpson another notable name on the final table before he exited in sixth-place for $3,750.